Two narratives now compete for the interpretation of the situation – or more precisely, a narrative and a vision. According to the narrative upheld by the current government, it’s a story of Pinocchio getting high with Icarus: whether seduced by flat-screen televisions, large jeeps or yachts and jets (expensive drugs and prostitutes remain at most alluded to), people fell for greed and hubris. The most excessive ones ‘must do some soul-searching and many must show humility’, according to PM Jóhanna Sigurdardóttir. (3) It is time to grow up, take responsibility and compensate for the damage we did in our drunken stupor. On the other hand, the vision upheld by former mayor, former prime minister, former Central Bank manager and now newspaper editor David Oddsson, and most members of his anti-EU republican Independence Party, sets off with a gesture of dismissal: obviously something went wrong – but now is no time to dwell on the past, for Iceland is under siege! As the UK and the Netherlands demand compensation, David has found his Goliath. What this country needs, his admirers exclaim, is a Churchill! Factually, neither account is false. Yes, those were greedy times. And yes, states seek to preserve their interests. The original IceSave contract was negotiated in June 2009 by a diplomat assisted by a young UK-educated philosopher. The government at first celebrated the conclusion, but the diplomat’s own description of the terms – ‘Iceland is taking on the sins of Europe, like Jesus on the crucifix’(4) – did not convince the public, nor the ‘unruly faction’ of the Left-Green Movement, as social democrats refer to their anti-capitalist partners in government. ‘The sins of Europe’ refers to the general understanding that as the Icelandic banks operated according to European regulation, as well as under British and Dutch surveillance, Iceland was not solely responsible for their catastrophic failure. Iceland must, however, ‘drink that bitter cup’ of restoring faith in the whole banking system, which was considered at stake. Whether seen as lack of vigour or willingness to negotiate, the eagerness to conclude the matter can in part be ascribed to, if not Schadenfreude, then at least a pseudo-Christian sense of guilt and remorse: this is what you get for succumbing to the evil right so willingly and for so long. These two factually coherent but unsatisfying accounts remain caught in a loop of incessant but immobile talk, prolonged in January 2010 by the president’s veto of the contract known as IceSave II, and a subsequent referendum last March. This 10 per cent of the country’s debt still takes up 90 per cent of the debate. Why? Apart from ordinary local polemics, what makes the IceSave issue such a dilemma is Icelandic authorities’ very first reaction to the collapse of the country’s banks: in October 2008, the Independency Party-led government overnight pushed an emergency law through parliament, fully securing all deposits in local accounts, while unambiguously signalling to the UK Finance Ministry that foreign depositors would get the leftovers at best. With the legislation, known among legislators as the ‘f**k-the-foreigners law’,(5) the right-wing government made sure that local capitalists would not bear an unnecessarily hefty burden of the crisis, buying them out, as one journalist put it, of any subsequent social upheaval. The emergency legislation has mostly remained beyond debate and no one has so far had to justify the policy behind it. If the matter momentarily surfaces it is brushed off as inevitable: ‘Anything else would have caused unprecedented riots.’ In other words: You, the debt-ridden majority of no or little savings, have already joined Europe’s precarious low-wage workforce, so that the upper layers won’t get angry at us. The anger of the upper layers is of a magnitude that you cannot fathom (they have our private phone numbers), whereas your anger (noticeable only when thousands of you gather and set fire to Christmas trees) is already under control. Now, go serve the tourist industry (and don’t leave your smile at home ;-). Factually the vote was about details – will we accept this particular deal, with its particular interest rates and terms of payments, or will we negotiate further? However, the deal being voted on was already obsolete at the time of the referendum, as Iceland had already received yet another incrementally better offer. Voting ‘yes’ would have been absurd and so the republic’s first referendum became a purely gestural event, a spectacle of solidarity aimed at the foreign press – but solidarity against what? According to the right, against foreign oppressors, of course. Much is at stake. The scheduled return to normality in Iceland is dependent on IMF loans, which are conditioned by traditional ‘structural adjustments’ (cuts in welfare, health etc.) and a solution to the IceSave crisis. Some also perceive the solution of the matter as a criterion for Iceland’s will and capability to participate in the EU, for which it has applied. But the anti-EU right-wing opposition is not the only opposition to the deals drafted. The ‘unruly faction’ of the Left-Green Movement has consistently opposed IMF cooperation. Their reasoning, however, does not reach a wide audience. That is not merely due to the media being pro-capital, which they are, but lies deeper. In short, Asterix has been available in Icelandic translations far longer than Immanuel Kant. Icelanders have been raised on a thorough conviction of their own singularity, a sentiment that runs deeper in public discourse than any universal ideal. (7) It is thus mainly thanks to international media and their fortunate oversimplifications that the referendum has been interpreted in terms of a universal anti-capitalist principle at all. A Financial Times leader was far from unique in warning that the UK must settle a deal, for ‘the wrath of the Icelandic public raises the prospect of citizens elsewhere refusing to pay for public debts seen as someone else’s fault’. (8) The implications of a people given legal authority to revolt against bank bailouts are explosive. What started, partly, as a misinterpretation, an exaggeration of the referendum’s factual content, has the retroactive potential to become true. While this single matter all but blocks out the attention of the media, Iceland undergoes complete restructuring from top to bottom. On the one hand, the government implements IMF strategies, making severe cuts in health care and education, paving the way for the country’s first private hospital (focusing on liposuction tourism), minimizing public broadcast services, and so on. On the other hand, ‘private enterprise’ is taking care of its own. When Iceland’s banks collapsed new ones were established overnight. As Geir H. Haarde, then prime minister, declared in October 2008, ‘This is not nationalization’ – meaning, this is done purely for the sake of private interests. Funded by the state, the new banks bought the old banks’ loans at a 50 per cent discount. (9) One has already been handed over to creditors and investors; the others are set to be re-privatized as soon as possible. While the 60 per cent of businesses are at the mercy of the new banks, the government has no policy about their operations, or principled criteria for default and resuscitations. As the banks go about their business, piecemeal information gathers into a coherent image: those who already wore tailor-made suits retain the lucrative parts of business, while those who never got out of their jeans and sneakers – employed, self-employed and unemployed alike – foresee a future of paying back the infinite tailor’s bill. (10) Ministers respond that they understand people’s anger and share their grievances. However, ‘more is needed than legislation, regulation or authorial orders’, as Prime Minister Jóhanna Sigurdardóttir explained in her recent address to the neoliberal lobby group Chamber of Commerce: ‘Manipulation is now considered the root cause of the bank collapse’, and so the government remains ‘absolutely opposed to politicians manipulating the financial system’ this time round. Let us make clear, before we move on to critique, that there is a world of difference between the current administration and the 1991–2008 administrations led by the Independence Party: the Independence Party and its businessmen are more akin to a highly organized criminal gang than a political party. As they held legislative power for so long, and as party members remain highly influential in business and society, it is uncertain what legal action can or will be taken – but let it suffice to describe one example, important but not unique, as a hint of the corruption at stake. When Landsbanki’s privatization was under way, in 2002, one man, Steingrímur Arason, resigned from the privatization committee, citing differences in opinion. Only after the 2008 collapse did the nature of that difference become clear: Prime Minister David Oddsson had decided, contrary to the committee’s advice, to hand Landsbanki over to his allies, father and son Björgólfur Thor and Björgólfur Gudmundsson. Whereas ‘distributed ownership’ had up to that point been a catchphrase of privatization, a new one was coined: ‘ballast-investors’. A single nautical metaphor seemingly moved the issue beyond debate. The Björgólfurs were said to have made their fortune with a beer brewery in St Petersburg, and so had the financial means to provide the required ballast. In 2009, however, it was revealed that half the purchase fee had been borrowed from the other recently privatized bank, Kaupthing, the managers of which were reluctant but gave in to political pressure. When both banks were returned, insolvent, into state hands in 2008, father and son had not paid back a single króna of the loan. In retrospect, the whole procedure amounts to an elected public official lending a bank to his friends for a few years, to have some fun – ‘go buy yourselves an English football team’. Meanwhile, the debt collected through Landsbanki’s IceSave accounts alone, the payment of which Oddsson now vehemently opposes through his newspaper, amounts to more than sixty times the purchase price the father and son pretended to pay for the whole bank in 2003. The damage done by the bank reaches further still, as has recently been revealed: a great deal of the Icelandic banks’ income in the twelve months preceding their collapse was derived from short-selling Icelandic currency – that is, essentially betting on the diminishing total worth of the Icelandic economy. (11) And diminish it did. There is no reason to suspect the current government of any such corruption. It has, however, taken on empirically verifying Slavoj Žižek’s postulate that whereas conservative parties tend to represent some particular (old) money, social democrats are more apt to represent capital as such. Minister of Finance Sigfússon, head of the Left-Green Movement, represents the values of ardent industriousness and integrity. In spring 2009, he arrived at government negotiations driving an ageing Volvo. Meanwhile, the silent, dignified proletarian Prime Minister Sigurdardóttir serves as the symbolic guarantor of fairness – under their insignia measures can be taken that would cause outrage if accompanied with MBA portfolios and the stupid glee of their holders. But no matter how socialist their aura, the fundamental political decision not to interfere with how the insolvent banks redistribute the country’s wealth may be the biggest single act of laissez-faire implementation in Iceland’s economy yet. What remains left, as capitalism is brought back to life with injections of public funds, are compassionate utterances of grief and scolding, better defined as poetry than politics. Poetry in the pre-modern, romantic sense; poetry before Rimbaud or Walt Whitman; poetry, to paraphrase Søren Kierkegaard, as so much ornamental boo-hoo. Kierkegaard famously elucidated the nature of poetry by analogy to an execution device: a brazen bull-shaped kettle designed for the Sicilian tyrant Phalaris. The victim was led through a door into the belly of the bull, the door shut, and fire set beneath, roasting the prisoner inside. The diabolic detail of the design, however, was a system of brass tubes attached to the bull’s head, which turned the victim’s screams into ‘the tenderest, most pathetic, most melodious of bellowings’. (12) Analogously, noted Kierkegaard, the poet’s agony, by virtue of his expressive nature, sounds like music to others’ ears. And, analogously still, we are all poets now. ‘The lid on the social kettle is shut triple-tight, and the pressure inside continues to build.’(13) Inside this kettle that unites us, you have the right to remain silent, but anything you say can and will be interpreted as a boo or a boo-hoo. In his book about the Iraq invasion, Iraq: The Borrowed Kettle,(14) Slavoj Žižek employs a well-known anecdote from Freud, about a man asked by his neighbour to return a kettle he borrowed: ‘Kettle? Which kettle? I borrowed no kettle, the kettle was broken when I got it, and there’s nothing wrong with it anyway.’ In much the same way, for the last twenty or thirty years, whenever someone mentioned the kettle that confines us, when someone spoke of capitalist oppression, a neoliberal Candide would be close by to reply: ‘Kettle? What kettle? There is no kettle, and anyway it’s a necessary kettle, the best kettle you could be in, the temperature’s just right, besides there’s no way out, so why bother?’ Kierkegaard’s analogy now describes a universal situation. Inside the kettle: we, the people, linguistic creatures of flesh and blood. Outside the kettle: the abstract tyrant of capitalism, operating beyond the symbolic field, beyond the scope of words and meaning. Operating, that is, through violence. As Naomi Klein argues in The Shock Doctrine, from Haiti through Chile, Iraq and China, neoliberalization has been backed up by brute physical force, at the hands of police or military forces. On 11 March 2010, the end of ‘Niceland’ noted by Boyes was clearly underlined as the public prosecutor pressed the first charges related to the 2008 financial collapse. Corruption and fraud may have all but bankrupted the country, but the people prosecuted were nine protesters, who in December 2008 entered the open public benches of parliament, presumably to make noises. Among those select nine are people who also took part in the lawless return of life to Skuggahverfi, so efficiently quenched by police. Those nine are charged with threatening the safety, autonomy and sanctity of parliament and public order, and face possible life imprisonment. There was a famous moment during the collapse of communist East Germany, when the Stalinist Erich Mielke, minister of state security – head of the Stasi – addressed Congress to convince its members that the Stasi had a singularly good connection to the public. It is November 1989. The members of congress laugh. ‘Ja, wir haben den Kontakt, ja wir haben den Kontakt’, says Mielke, agitated. As he addresses the congressmen as ‘liebe Kameraden’ some openly oppose and ask him not to use that expression. But that’s a purely formal question, objects Mielke, and then makes history with the painfully pathetic exclamation: ‘Ich liebe doch, ich liebe doch alle Menschen!’ Congress burst out in laughter. That emperor never found his clothes again. This effect of shared responsibility, this mutual hostage situation of critique, shows democracy at its worst, democracy as a successful means to eliminate any outside. As everyone involved has already invested in the route decided upon, there is no one around to make the truth-gesture of pointing and laughing at the naked emperor, the gesture assigned to a child in Hans Christian Anderson’s anecdote. 1. Editor’s blog, www.ruv.is/heim/frettir/innlendar/kosningar/2009/blogg/meira/store807/item261997/ (link is no longer active). 2. Culture journalist Hjálmar Sveinsson noted this first: http://blog.eyjan.is/hjalmarsveinsson/2010/01/26/8/ (accessed 13 March 2010). 3. Prime Minister Jóhanna Sigurdardóttir at the Iceland Chamber of Commerce’s annual congress, 17 February 2010, www.forsaetisraduneyti.is/media/frettir/Vidskiptating.170210.pdf. 4. Svavar Gestsson interview with Morgunbladid, 8 June 2009. Summary: http://eyjan.is/blog/2009/06/08/svavar-thetta-er-leid-ut-ur-fataektinni-en-ekki-leidin-til-fataektar/ (accessed 13 March 2010). 5. 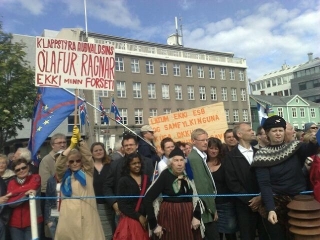 According to historian Gudni T. Jóhannesson, in Fréttabladid, 10 March 2010: ‘if deposits in the Icelandic banks had not been guaranteed we would have faced chaos … that was among the issues at stake in the so-called emergency law, the ‘f…k the foreigners-law’ as some of those who authored it called it amongst themselves.’ http://silfuregils.eyjan.is/2010/03/10/gudni-icesave-og-rikisabyrgdin/ (accessed 13 March 2010). 6. Cf. Egill Helgason, Reykjavík Grapevine, March 2010: www.grapevine.is/Home/ReadArticle/How-to-Succeed-in-modern-business-Olafur-Ragnar-Grimsson-at-the-walbrook-club (accessed 13 March 2010). 8. Financial Times, 26 February 2010, www.ft.com (accessed 13 March 2010). 9. http://eyjan.is/blog/2010/03/12/lan-voru-faerd-i-nyju-bankana-a-meira-en-helmingsafslaetti-langmest-afskrifad-hja-arion/ (accessed 13 March 2010). 10. See, for example, http://eyjan.is/blog/2009/10/01/ar-lidid-fra-hruninu-audmennirnir-halda-enn-fyrirtaekjum-sinum/ (accessed 13 March 2010). 11. Around 1 trillion ISK were supposedly gained through these short positions, or €5–6 billion at current rates. http://eyjan.is/blog/2010/03/12/sedlabankinn-stod-ekki-vaktina-bankar-foru-offorsi-i-gjaldeyriskaupum-foru-gegn-landi-og-thjod/ (accessed 13 March 2010). 12. The Works of Lucian of Samosata, Clarendon Press, Oxford, 1905, ch. 28. 13. The Invisible Committee, The Coming Insurrection, Semiotext(e), Los Angeles, 2009, http://tarnac9.files.wordpress.com/2009/04/thecominsur_booklet.pdf. 14. Slavoj Žižek, Iraq: The Borrowed Kettle, Verso, London, 2004. 15. Roger Boyes, Meltdown Iceland, Bloomsbury, London, 2009, p. 186.